“Growing up on a dairy and poultry farm gave me a great appreciation of farming, especially the farming lifestyle, so the decision to purchase a poultry farm once I was grown was an easy one. After years growing for several different integrators, I was miserable, and so were the birds. I knew there had to be a better way... a way to partner with farmers, treat them fairly, while achieving the highest levels of animal welfare. Farmer Focus brings to market a product that consumers not only find delicious, but delivers the peace of mind that they are supporting hard working family farmers. I could not be more proud of our farmers and the hard working team. An amazing journey it has been! CEO of Shenandoah Valley Organic on his family's turkey farm at 3 years old (pictured right, Bradly Heatwole of Pine Ridge Poultry pictured left). You've never met a person more passionate about poultry until you've met Corwin. Corwin was just 3 years old when his father built his first poultry house—he grew up farming and raising chickens for most of his life. Tending poultry and experiencing the day-to-day operations inspired Corwin to purchase a farm of his own—20 years later at age 23. The first Organic flock, and Corwin’s son, Colton. Like father, like son! Shenandoah Valley Organic first begins as an idea, and then a small-scale Organic farm—raising just 300 chickens. 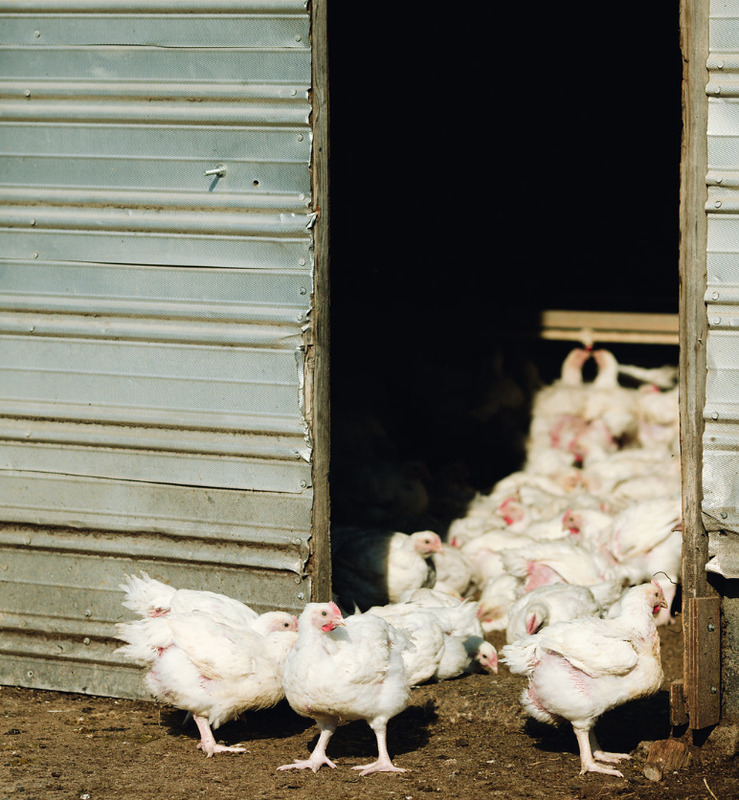 Corwin believes there is a need for high-quality chickens raised with dignity and care. His belief and ethics pay off, and he’s able to grow his flock to 3,000 birds within a few months. One of the first farms with SVO, Nash Hill in Fulks Run, VA. The Farmer Focus business model emerges from conversations with local farmers about the potential of creating a new kind of company. Local farmers are frustrated about standard farmer contracts with integrated companies what won’t allow them to control their own farms, and force them to compete against one another for compensation. These round-table discussions formed the roots of SVO’s innovative contract model that allows farmers ownership of their chickens, their feed, and control of their farming operations. The lush, bountiful farmland region of the Shenandoah Valley has a long history of agricultural tradition and innovation. This is where Corwin and his cousin Jefferson grew up learning about farming and food production. From early on, they wanted their business to be recognized as a clean-food company, not just a chicken company, so they opted to use “Organic” instead of “chicken”. The resulting company name, Shenandoah Valley Organic, pays homage to the past, while also looking to the future with healthy and sustainable farming practices. SVO starts with raising Organic chickens on two family poultry farms—Nash Hill and Pine Ridge Poultry——but rapid growth justifies quickly partnering with additional farmers. To scale operations, SVO decides to open a processing facility and increases from two poultry farms to a dozen neighboring farms over the next year. The evolution of Shenandoah Valley Organic exists to breathe new life into established ideas, modes of business, and even physical spaces. In 2014, Corwin cut the ribbon on the current processing plant—a vacant building before SVO gave it purpose once again. The following year, SVO finds a home for its first corporate office in the renovated Harrisonburg Ice House—another building that had been left empty for years. SVO’s business model also encourages farmers to make minor renovations to older livestock houses to reuse them as free-range houses. Unlike the costly upgrades required by integrated contracts, these renovations are usually small changes—like adding doors to let the chickens outside, and creating windows to allow for natural light to fill the houses. It turns out, chicken raised ethically and humanely is in high demand! SVO’s production far exceeded initial projections, so they develop two new retail brands—Red Wheelbarrow and Blue Ridge Trail—to sell locally and regionally. 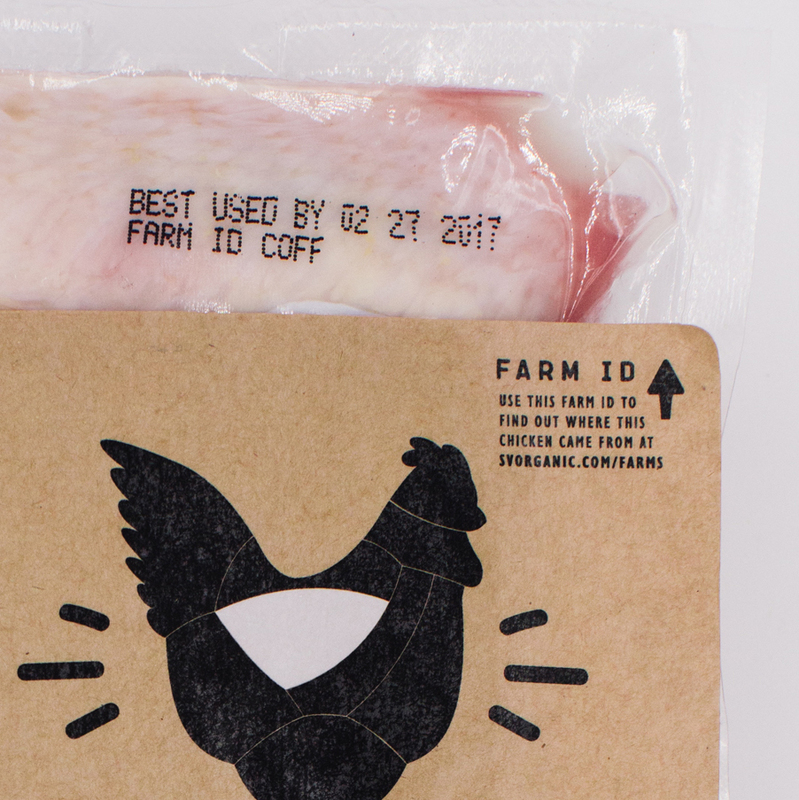 Through the development of these brands, SVO lands on Farmer Focus, and introduces the innovative 4-letter Farm ID—a coding system that traces each chicken to the farm it grew up on. Creating this bridge between customers and farmers becomes an important part of what SVO stands for as a company: transparency and traceability. SVO’s brand development: Red Wheelbarrow, Blue Ridge Trail, and Farmer Focus. Customers immediately notice the high quality of SVO’s product. 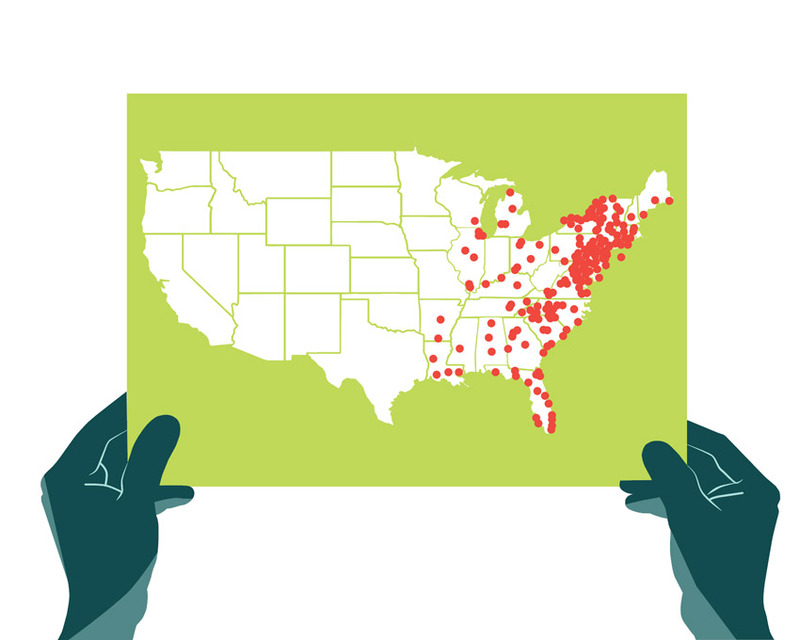 As more farmers join with the company, they grow outward from local and regional markets to national markets—selling their products up and down the Atlantic seaboard and towards the midwest. With the newly renovated plant, SVO opened their doors to producing a line of antibiotic-free (ABF) chicken to help fill production lines. After a little more than a year (and some soul searching), they make the decision to return to their roots as a 100% organic company—and they never look back. Valley Dish I, at Bella Luna. One of SVO’s missions is to provide access to healthy and delicious food. Once the Farmer Focus brand is up and running, they begin to explore different ways to help connect neighbors with local food producers in the Shenandoah Valley. SVO partners with local chef Colin Auckerman to create a collaborative dining event series called The Valley Dish—a farm-to-table dinner that pairs a chef with several Shenandoah Valley food producers to create a multi-course meal with locally-sourced ingredients. (top left) Chef Michael Symon has developed several recipes exclusively for SVO using Farmer Focus Chicken. (top right) Roasted Chicken Dinner recipe by Lexi’s Clean Kitchen. (bottom left) Chicken Shawarma Bowl recipe by Table for Two. (bottom right) Korean-Style Grilled Chicken recipe by Brooklyn Supper. After receiving high reviews from local chefs and neighbors through the Valley Dish series, SVO begins reaching out to culinary experts—influential voices in the food world whose values align with SVO’s missions. Several partnerships begin during this including relationships with food bloggers Lexi’s Clean Kitchen, Brooklyn Supper, and Table for Two. In 2018, SVO partners with Chef Michael Symon of ABC’s The Chew, and gains more national credibility as an innovative company producing quality products. In early 2018, SVO re-launches all products under a single brand with a new look: Farmer Focus. SVO is first and foremost a company founded by farmers, for farmers, finding solutions to issues facing family farms across America—and this label places that story on the center stage. In September of 2018 SVO becomes a sponsor of Farm Aid , a nonprofit organization whose mission is to keep family farmers on the land. This Concert benefit founded by Willie Nelson, Neil Young and John Mellencamp (with Dave Matthews joining in 2001), has grown into a comprehensive organization that offers funding, informational resources, and support services to family farms in crisis. Throughout 2018, SVO continues to build relationships with innovative, like-minded partners in the food and farming industries (Fresh Direct, Butcher Box, Local Food Hub) and work to extend product offerings through larger retailers (like Costco.com) to make Organic Free-Range Chicken more accessible to more people.